Plant trees and shrubs. Trees that shade your house can significantly lower the inside temperature, plus they help to cool the air outside by releasing moisture. Talk to an expert about which trees are best for your area and soil. Of course, trees take a while to get big enough to do much good. While you are waiting, plant some shrubs or put up some trellises and let vines grow up them to provide some green relief. Use technology to determine where you might be wasting electricity. A $25 device called the Kill a Watt power meter can measure the power wasted by various appliances. Before you buy, though, check with your local government to see if you can borrow a similar device for free from city hall or your local library. Or see if your power company does a free assessment. Also, you can replace your old thermostat with a new one that you can control from your smart phone, so you don’t have to cool your house as much when you are not home. Avoid running heat-generating appliances during the day. Instead, run your dryer, your oven and your dishwasher in the early morning or at night. 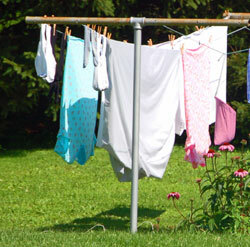 Or replace your dryer altogether with a clothesline. As a bonus, your clothes will smell fresh. (If you suffer from seasonal allergies, though, don’t dry your clothes outside, especially when the pollen count is high.) Also, replace incandescent lightbulbs with compact fluorescent bulbs, which create much less heat. Consider leasing solar panels. That gives you a chance to try out solar power without making a big up-front investment. Solar often can save you 10 percent to 15 percent over buying traditionally generated power. Consider replacing your black roof with a lighter color. Black absorbs heat, which can significantly raise the temperature on the roof and in the attic. By replacing traditional black roofing shingles with lighter reflective ones or by adding a reflective coating to your roof, you can cut your air-conditioning cost by up to 20 percent.